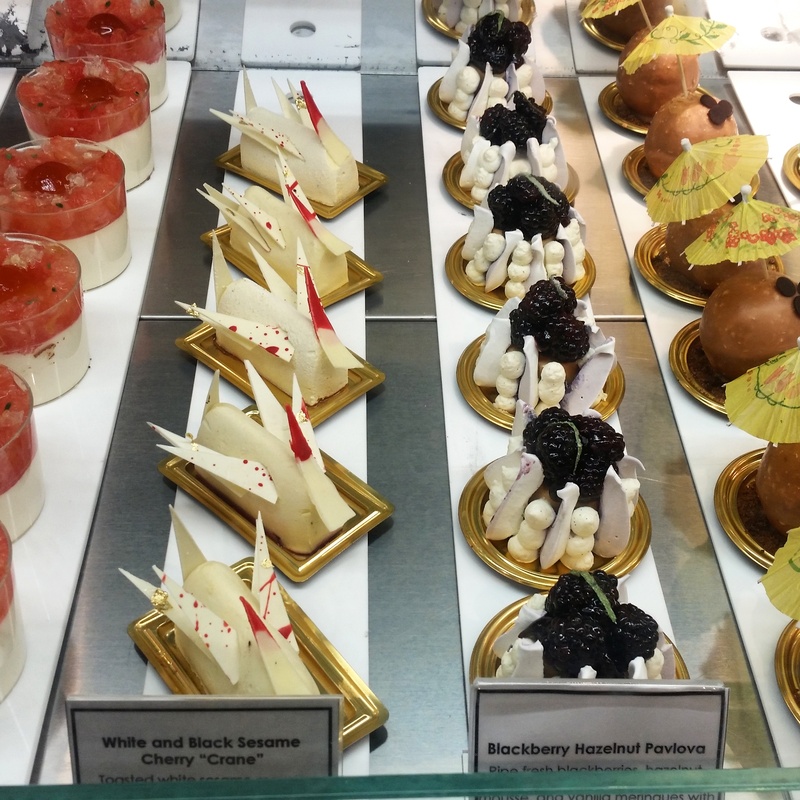 eat all the things- nyc edition | loveliness. My trip to NY last month was basically just a blur of meetings and rain, it was pretty miserable the whole time I was there. But luckily I had a whole Saturday with decent weather to kill before I flew home, and I knew exactly how I wanted to spend it. I had gotten recommendations from everyone at work for the best places to eat (read: best desserts) in the city, and also done some reading up myself, and had a solid plan to visit as many of the places as I could. 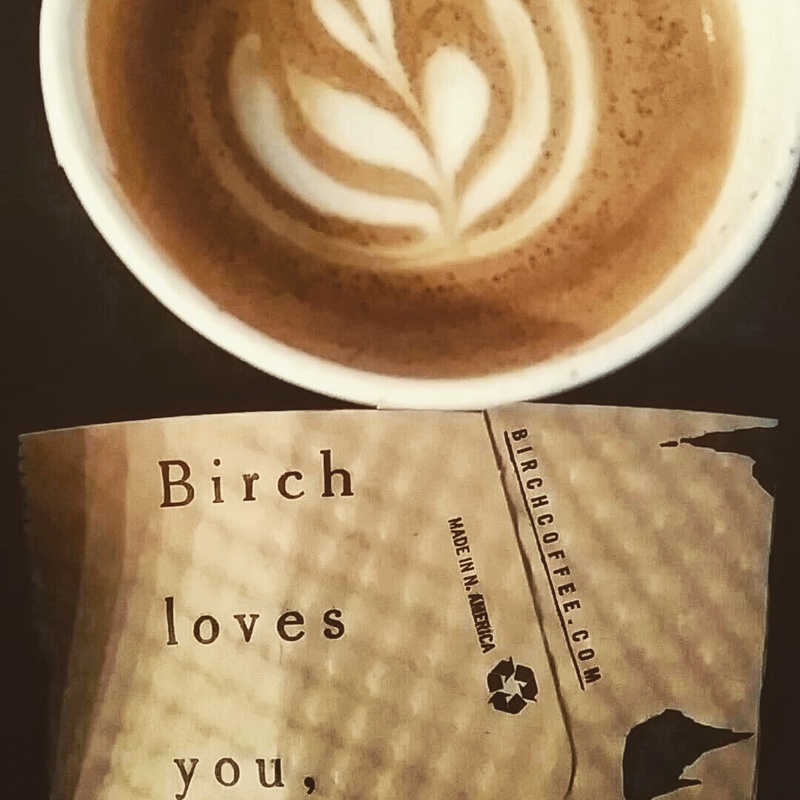 I started first thing in the morning at Levain. It was pretty cold out so early in the morning, but it was only about 5 blocks from my hotel, so I decided to walk. 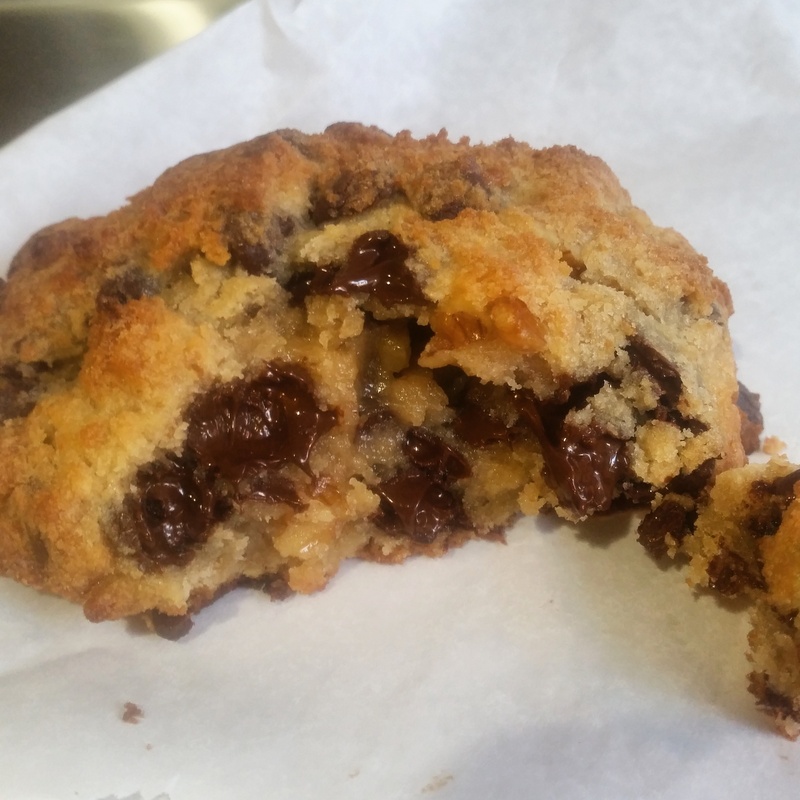 Levain was voted best cookies in the city by almost everyone I talked to and everything I read. 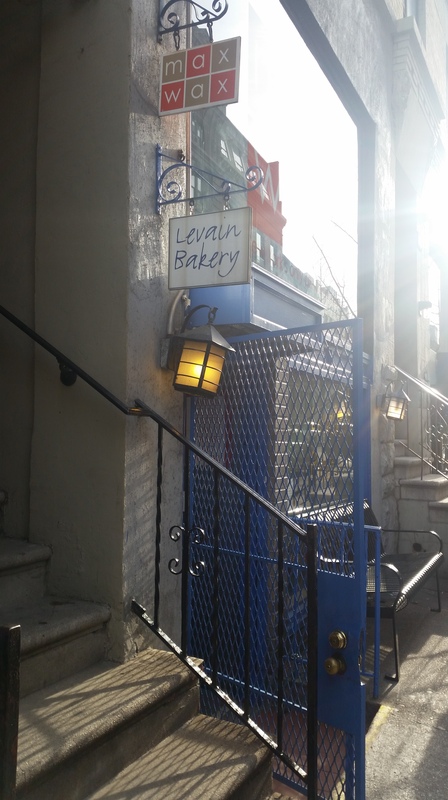 It’s a tiny little basement bakery with a tiny sign and a bright blue door. It’s at the very edge of a residential street leading to the park, so if you didn’t know it was there (or see the long line out the door) you would probably walk right by it. I got a walnut chocolate chip cookie, which is supposed to be the best kind, and a cappuccino, and grabbed one of about 3 stools in the corner to enjoy it. The cookie was really delicious, it was also about half the size of my face so eating it first thing in the morning was probably not the smartest idea, I felt sick almost immediately. I do wish they had a chocolate chip cookie without walnuts, I don’t even like walnuts, but I still thought the cookie was amazing, so that should give you some idea of how good it was. After my cookie, I walked all the way back through Central Park clutching my cappuccino for warmth, and hopped on the subway to head to SoHo for the next stop on my list. I always think I am an expert at getting around on the subway, and most of the time I can get around fine, but just when you think you know where you are going there is construction, or a track change, or a train that only goes to a certain place from 7-9 pm every third Wednesday of the month. I eventually made it to SoHo. I had to get off 3 stops early, but I didn’t really mind. It’s such a neat area, and there are soooo many amazing stores. I didn’t go in any of them because I knew I would buy all the things and I didn’t want to carry a bunch of bags around with me for the rest of the day. 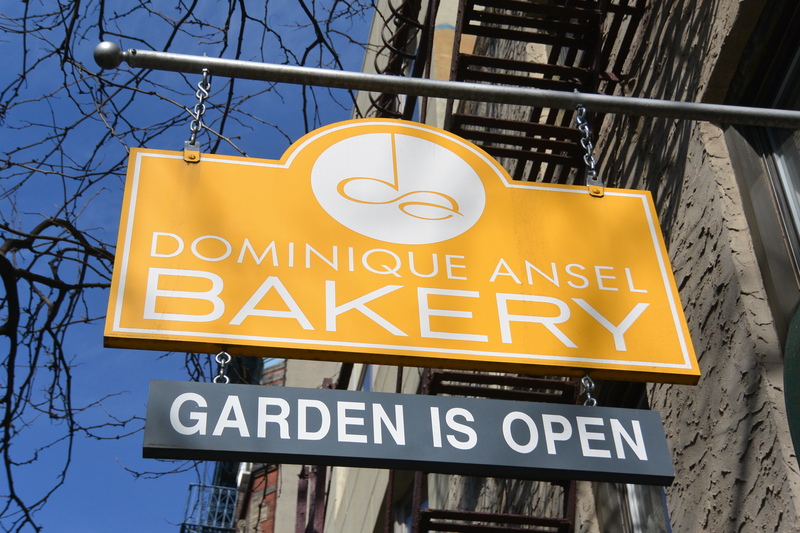 My next stop was Dominique Ansel, because I really wanted to try their shot class chocolate chip cookie filled with milk. Unfortunately, I didn’t realize they don’t start serving it until 3:00 pm, and I was there at about 9:00 am. 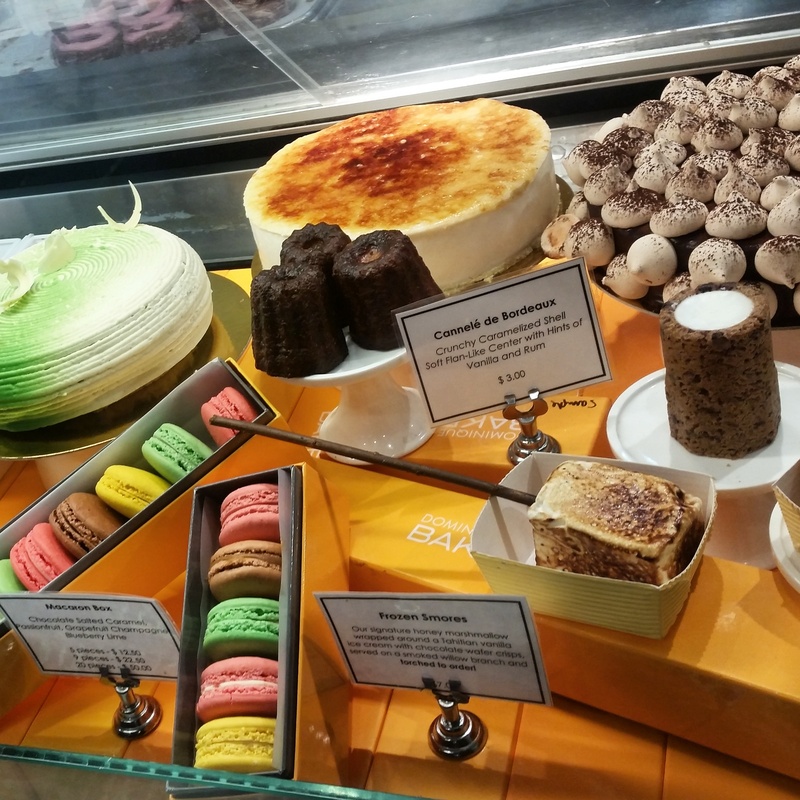 The vast array of gorgeous pastries and desserts kept me from feeling too disappointed, and eventually I decided to get a cronut (oh yeah, they also invented the cronut) and an egg sandwich since I was still feeling kind of sick from my cookie sugar rush earlier. 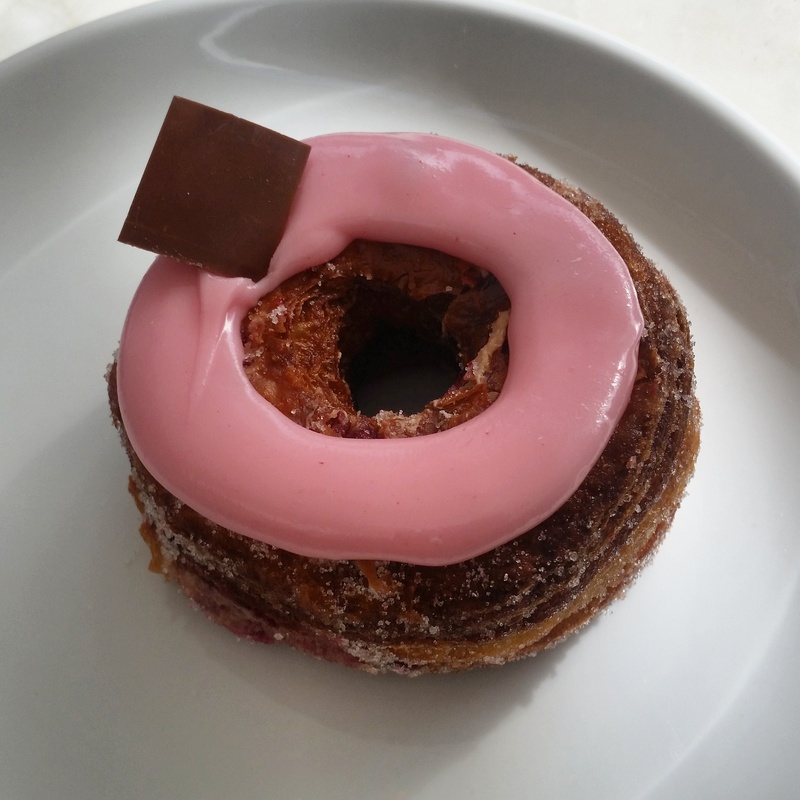 The cronut was just OK for me, I loved the actual pastry, but one of my least favourite things on the planet is a surprise filling, and there were layers of surprise raspberry filling inside the cronut. It was a little bit tart, so it paired really well with the super sweet icing on top. Objectively, I could see why people like the flavour combination, but surprise filling is the devil’s handiwork, I’m almost sure of it. The egg sandwich on the other hand, was absolutely delicious. I barely even like egg sandwiches, and it was one of the most delicious things I’ve ever had. After Dominque Ansel, I walked around SoHo some more, wandered through Little Italy, then set out for the Brooklyn Bridge. I must have walked 20 miles in total so I really didn’t feel bad about eating everything that entered my field of vision. Walking across the bridge was really cool, and something I’d wanted to do since my first trip to NYC, but it was really cold out that day. By the time I got across the bridge and wandered around the Dumbo area and the waterfront, I was frozen and starving. I set off in search of sustenance, and came around a corner to see two restaurants with lines of people waiting in the cold to get in. I looked them both up on line, they were Juliana’s pizza and Grimaldi pizza. 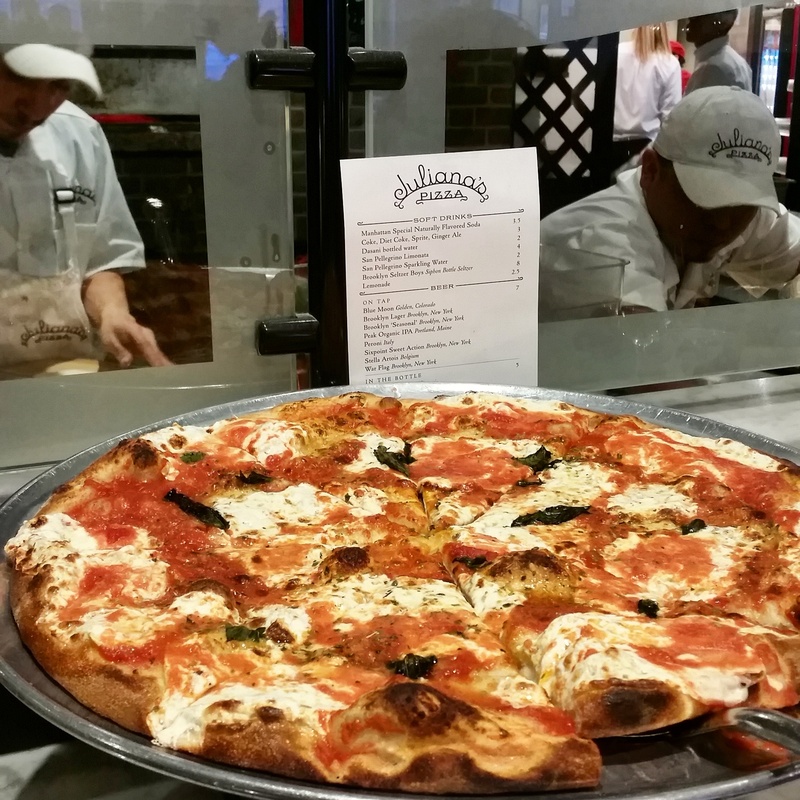 Apparently the owners of Grimaldi, which is a very famous NY pizza place, sold Grimaldi years ago, but didn’t like the way the new owner was doing things, so they opened up a new restaurant called Juliana’s to compete with them. 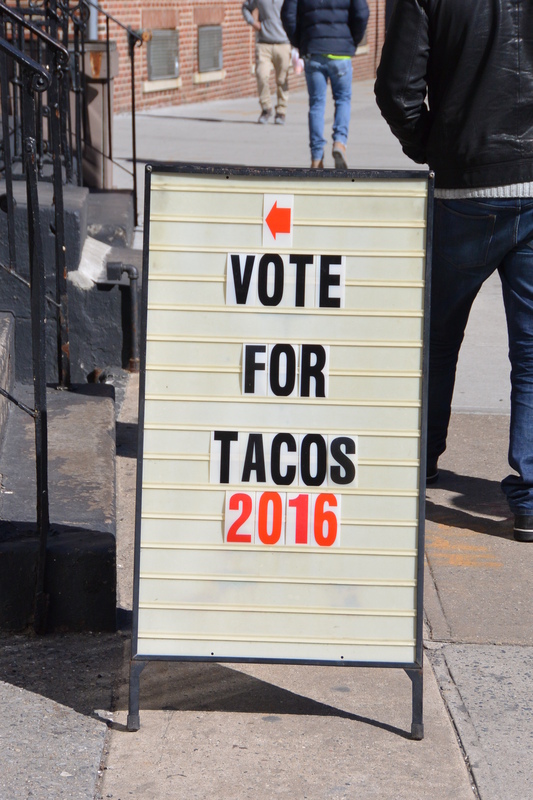 It was a battle of the pizzas, and that is something I can always get behind. I ended up picking Juliana’s and ordering a glass of wine and a margherita pizza. They had a sit up bar to the pizza chefs, so I got to sit up there, eat my amazing pizza and watch them work. I was absolutely frozen when I got in there, so sitting right beside the wood fired oven with a glass of red wine was probably pretty close to what heaven is going to be like. I was so comfortable I almost fell asleep. And that is the story of how I ate my way around NY for one day. 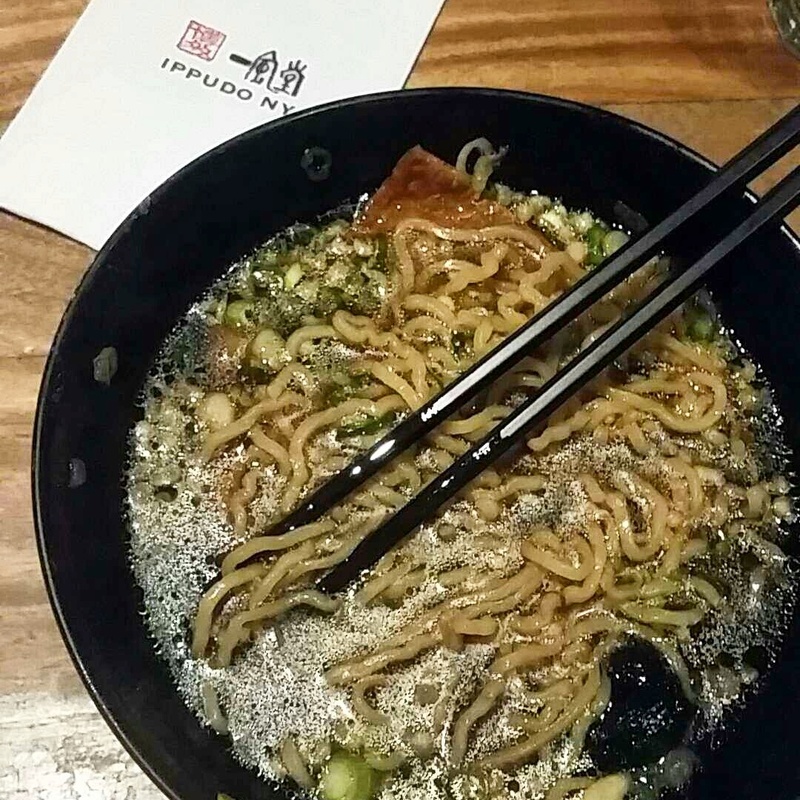 There are also a few other snaps, including my first ever ramen experience at Ippudo. It was a two hour wait, so we killed time with tequila shots at a bar around the corner, and we didn’t end up getting in to eat until 10:30. They did have vegetarian ramen, which was awesome, but hands down the best part was that you could order another ball of noodles for your soup for only $2. What a time to be alive. There are still tons of places that are on my list including almost every single place listed out in here, so I’ll have to start planning my next trip soon.